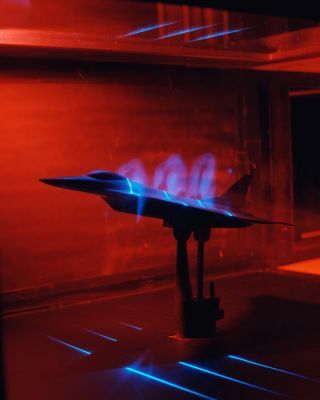 This F-16XL Scamp is undergoing a visualization test in a wind tunnel at Langley in 1992. In this historical photo from the U.S. space agency, an F-16 Scamp model being tested in the BART on Oct. 6, 1992. The photo shows a basic flow visualization test using smoke and a laser light sheet to illuminate the smoke. This test was performed as a part of the NASA High Speed Research Program.